The owner of an international company whose business as a coffee merchant takes him to exotic destinations as far apart as Dubai, Morocco and Korea has selected south east Spain as the ideal location for a family holiday home in the sun. Martin Symington (55) – managing director of Coffee Merchants Ltd which he set up in Northern Ireland three years ago, and whose home is in County Down – has just agreed to buy the first in a new generation of exclusive detached homes planned for Desert Springs, Europe’s only international award-winning luxury family resort and championship desert golf course in the Almeria region of south-east Spain. The property – named The Caprichosa – will have an exterior design inspired by some of the old manorial farmhouses which can still be seen in Almeria. The developer, the Almanzora Bay Group, says it reflects the way in which, over many centuries, extensions and additions to properties like these – regarded as historically important – create visual variety and architectural interest. someone who has a caprice, a whim or a fancy of their own, and this is very much in keeping with the concept of the plans for the property,” says Bridget Rosser, sales and marketing manager of The Almanzora Group based in Cheltenham and agent for the properties at Desert Springs. Martin and his wife Sandra will be encouraged to work with the architect to overlay their own ideas on the developer’s plans for their property which will occupy a plot of 0.14 hectare (just over a third of an acre) on the banks of the established Tiburon Lake. 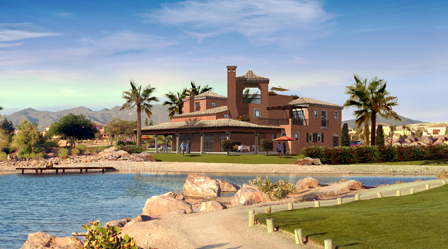 The site is just across the water from the fourteenth signature hole of the resort’s Indiana Desert Golf Course. The couple’s decision to buy the Caprichosa for around €2.5 million – the actual price will depend on their final specification – underlines their enthusiasm for Desert Springs where they bought their first overseas property six years ago. “I had just taken up golf and spotted a newspaper advertisement for Desert Springs,” recalls Martin. “It inspired me to take a look and, having done so, we bought a four- to five-bedroom Herencia country house there. “Desert Springs had immediate appeal. I love the dramatic and undeveloped nature of the environment, and I was impressed by the quality of the buildings taking shape in the resort. Martin and Sandra have four children and seven grandchildren, so their property is fully used by family and friends throughout the summer months. “We now need more than four plus the occasional five bedrooms and when we saw the plans for the Caprichosa we knew that trading up to buy the first one would be our next step,” said Martin. He describes each time he arrives at Desert Springs as “like coming home because the welcome is always so warm” and he praises the high calibre of service demonstrated by The Almanzora Group at the time when he negotiated his first purchase. Construction work on the Symingtons’ new Caprichosa will get underway next year reports Bridget who describes it as “the most prestigious residential property yet planned at Desert Springs.” Currently she is selling a variety of other properties in the resort, ranging from apartments, townhouses and cottages to villas and country houses at prices starting at €233,000 for an apartment, rising to around €2.5 million for a spacious country house like the Caprichosa. The Symingtons’ first home at Desert Springs was a spacious four-bedroom plus occasional fifth bedroom/study, four-bathroom, fully air-conditioned and secure Herencia Country House. Planned with careful attention to detail, it combines authenticity with modern day requirements; for example although windows have high performance double glazing, they are designed and custom-made to replicate the oval and square windows seen in old country homes of this type. The Symingtons paid €900,000 for their property when they bought it off-plan in 2002 but Martin reckons that the increase in capital values at Desert Springs in particular would still make it worth about €1.2 million now, despite the recent market problems generally. The property, which the owner can modify to accommodate up to six or even seven bedrooms, is designed for indoor/outdoor living. The ground floor has a spacious family living room, a semi-separate dining room and fully-fitted kitchen and breakfast room, each opening on to a covered terrace of over 1,000 sq ft. It includes areas designed and laid out for al fresco dining as well as an outdoor lounge complete with a fireplace, and for sunbathing. Also on the ground floor are a study and two of the double bedrooms. With their own semi-private entrances off the entrance hall and courtyard, they are designed as guest suites. All bedrooms have their own private bathrooms. On the first floor are two principal bedrooms, one of which is linked to the staircase by a ‘reading gallery’ overlooking the family living areas and main terrace below. Both bedrooms open on to their own private sun terraces. All floors of the property will have air management. The basement comprises 165 sq m (more than 1,750 sq ft) of naturally cool space, including a games room, occasional accommodation and spaces for other facilities such as a gymnasium, a spa with Jacuzzi and sauna, a wine cellar, utility and laundry rooms. The property includes a generously proportioned double garage with ample storage and workshop space. A large proportion of the energy supply for the property will be supplied by solar panels, taking advantage of the unique climatic conditions at Desert Springs. Internal finishes will be specified in accordance with the purchaser’s wishes. The Caprichosa will have a total internal floor area of around 480 sq m (5,170 sq ft), with terraces of 150 sq m (1,600 sq ft). Outside the property will be fully landscaped to create the type of desert garden which resulted in the developer – the Almanzora Bay Group – being awarded the UK’s New Homes Garden Award 2007 in the category Best Garden / Landscape – Overseas Development. A 10 m x 5 m level deck swimming pool is included in the garden of The Caprichosa. The site earmarked for construction of the Symingtons’ property is on the banks of Tiburon Lake, the first of three linked lakes planned in the resort. The largest, Steamboat Lake, will be used for a variety of ‘peaceful’ water sports ranging from sailing and canoeing to windsurfing. The middle lake, Sweetwater, already is being stocked with bait fish for the introduction of black bass game fish in the near future. To avoid confusion, please note that this document refers to two organisations with names which are similar but different. They are The Almanzora Bay Group [THE DEVELOPER] and The Almanzora Group Ltd [THE AGENT]. The Almanzora Bay Group, named after the Almanzora region of Eastern Andalucia where it has been active since 1985, is an Anglo-Spanish sister group to the award-winning Cheltenham-based developer, the Robert Hitchins Group. Established in 1958, the Robert Hitchins Group specialises in large-scale strategic land planning and commercial development in the West of England and South Wales. The Almanzora Group, which is a subsidiary of the Robert Hitchins Group, is the main European sales agent and acts exclusively for the development companies which comprise the Almanzora Bay Group, marketing new properties developed by The Almanzora Bay Group in resort, village and beach locations. 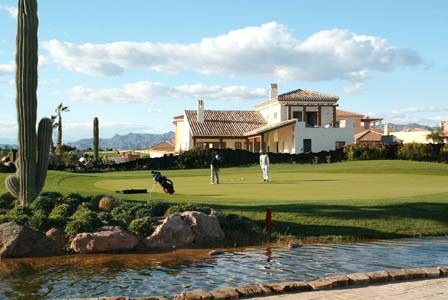 Please note that none of the above have any connection with the Spanish development known as The Almanzora Country Club.